CHENNAI : The bid to smuggle gold through the Chennai International Airport has gone up by 46.35 per cent compared to the previous financial years as passengers have been trying every trick up their sleeves to smuggle the yellow metal, according to Customs officials. 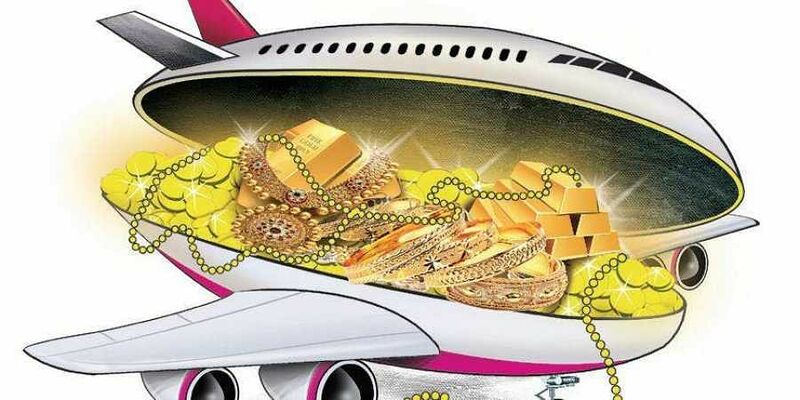 According to information available with Express, this year, the Customs foiled bids to smuggle 270.597 kg of gold worth Rs 86.55 crore from the airport during 2018-19 financial year. A total of 461 cases were booked. That is an increase of 109 kg and experts blame it on being the election year. Last year, Customs officials at the Chennai airport foiled bid to smuggle 161.924 kg of gold worth Rs 47.41 crore while booking 315 cases. “This year the customs department booked 461 cases and the major seizure included 40 kg of gold worth Rs 12.53 crore on May 8, 2018 wherein two foreign nationals were arrested,” said sources. A Customs official told Express that the rise in gold smuggling was due to a complex mix of the difference in domestic and international prices of gold as well as the exchange rate variations. “The London Metal Exchange price currently is about Rs 2,880 per gm whereas domestic purchase price is around `3,270 per gm. From this when the smuggler deducts his expenses, he gets about Rs 2 lakh per kg of smuggled gold from Dubai,” he said. This difference is attributed to the import duty on gold which is 10 per cent apart from the GST at the rate of 3 per cent. Manoj Jain of R L Jewels said that the rise in smuggling was blamed on the rise in import duty and the GST which comes to 13 per cent besides other duties like education cess, and exchange rate. He says the government gets Rs 1 lakh crore from the gold and jewellery sector as taxes. Of this, Rs 36,000 crore approximately is collected through direct taxes. On an average, India imports 800 tonnes of gold, he says. Traders say that seizures may have gone up but it is just a drop in the ocean. “More than 30 per cent of gold smuggled inside India goes undetected,” they said. Gold is considered to be the best bet in hawala transaction, a trader claims. What lures the carrier is the returns. On an average, the gold is 15 per cent cheaper and the trafficker doesn’t mind spending up-and-down fare from Dubai. For 300 gm, he makes Rs 1.5 lakh.Interestingly, traders want the government to reduce import duties which would bring down smuggling. Jain says, “This is affecting our artisans and trade. We are seeking reduction in duties which will result in more import and will curb smuggling,” he says.